It has begun. One month. Fifty thousand words. No excuses. That’s what it says on last year’s NaNoWriMo Winner T-shirt. If I’ve done it once, I can do it again, right? Last year was my first attempt at NaNoWriMo and even though I came down with a particularly nasty virus on November second, I still managed to get my fifty thousand words before the month was over. I gave the virus a couple of days that were all lounging in bed with no writing and I made up for it on the day after Thanksgiving, when I wrote all day while eating leftover pie and watching Christmas videos. That will not be an option this year. Thanksgiving comes late this year, on November twenty-eighth. We’ve booked the tie-dye business into a booth at the local market on Small Business Saturday, which is the thirtieth. I dare not put off validation until the twenty-ninth, when thousands of other folks will be trying to validate. I’ve heard scary stories of the NaNo validation program coming up with a word count that does not match the count of one’s personal word processor. I don’t want to be scrambling for extra word count or fearing the crash of the validator on my favorite pie and video day, so I’m setting the goal of being finished by the twenty-sixth. 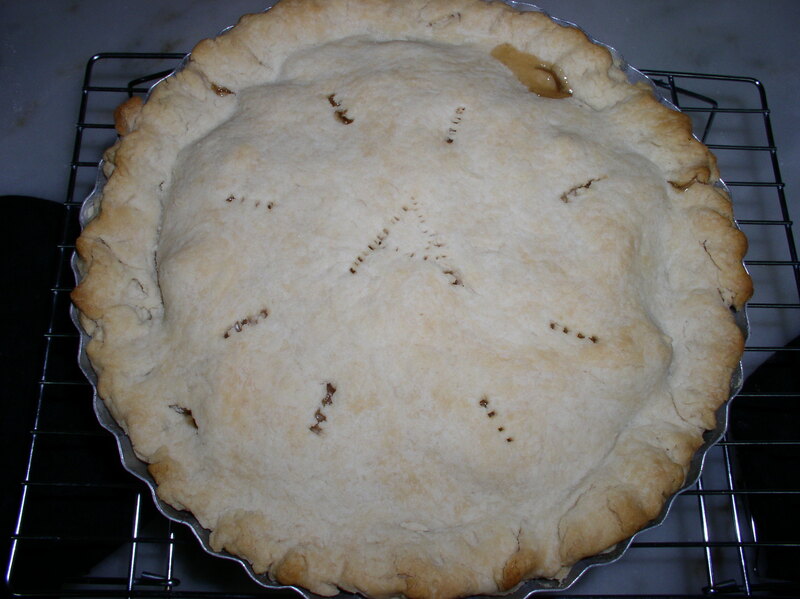 The twenty-seventh will by my pie-baking day and the next day, I will be hosting a huge family gathering at my house. 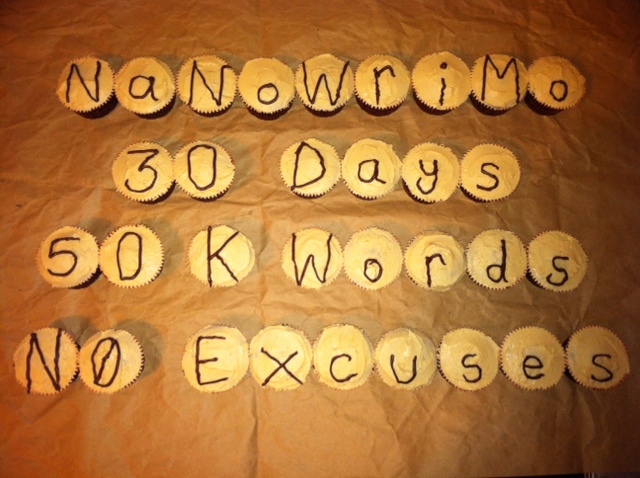 When I think of the things I’m thankful for that day, I want “finishing NaNoWriMo 2013” to be on that list. Yesterday was kick-off day and I shared it with my older daughter, who is the one who talked me into trying NaNoWriMo last year. She first tried it in 2011 and she has two wins under her belt, so she’s an old hand who makes the whole thing look easy. More importantly, she makes it look fun. Plenty of people kick off NaNoWriMo at midnight, after partying for Halloween (or “NaNo-een”, as my daughter and I are beginning to call it), but I am not a night person. My brain does not want to function past eight or nine o’clock, so my plan was to get a good night’s sleep and start my novel when I was feeling alert and full of first-day enthusiasm. Also, there was half-price chocolate to be acquired. My daughter doesn’t get up early very often, but she’s willing to do it for half-price chocolate. 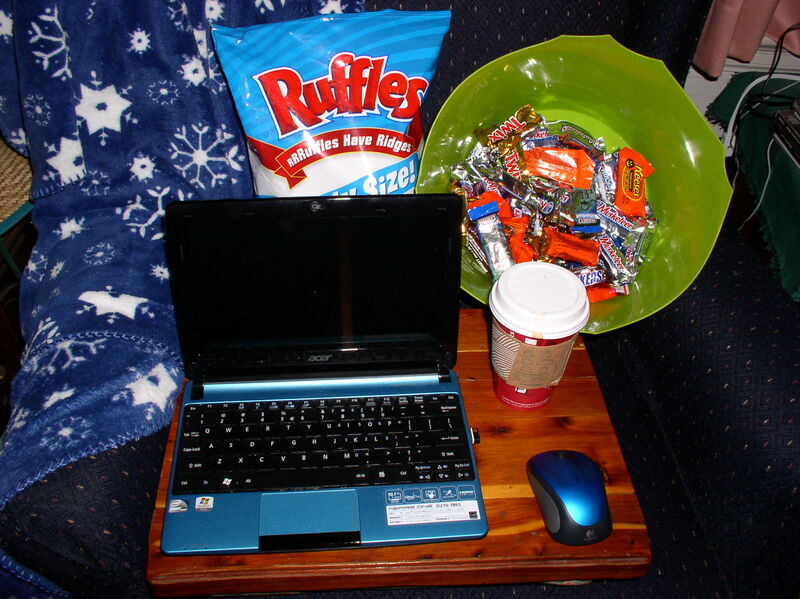 Our after-Halloween shopping tradition predates our NaNoWriMo tradition by many years. That story could be a blog post all by itself (along with a haul video if I knew how to make one) but let’s just say that our mission was accomplished and we now have enough chocolate to get us through November. Our NaNoWriMo kick-off tradition involves Starbucks. Last year, we actually took our netbooks there and started our novels at a table outside, with lattes in hand. That quickly became uncomfortable and we ended up taking our lattes to my living room, where we could kick back in soft chairs and relative privacy. It seems we do not write well with others. This year, we didn’t even try. We got our fancy drinks to go and drove back to my house to set up our writing stations. Netbook, check. Eggnog latte, check. Fleecy blanket, check. Leftover Halloween candy, check. Ridged potato chips, check (hey, they were on BOGO at Publix and NaNoWriMo was the perfect excuse to allow myself this rare indulgence. Just F.Y.I., they do not go well with eggnog latte). I was ready. 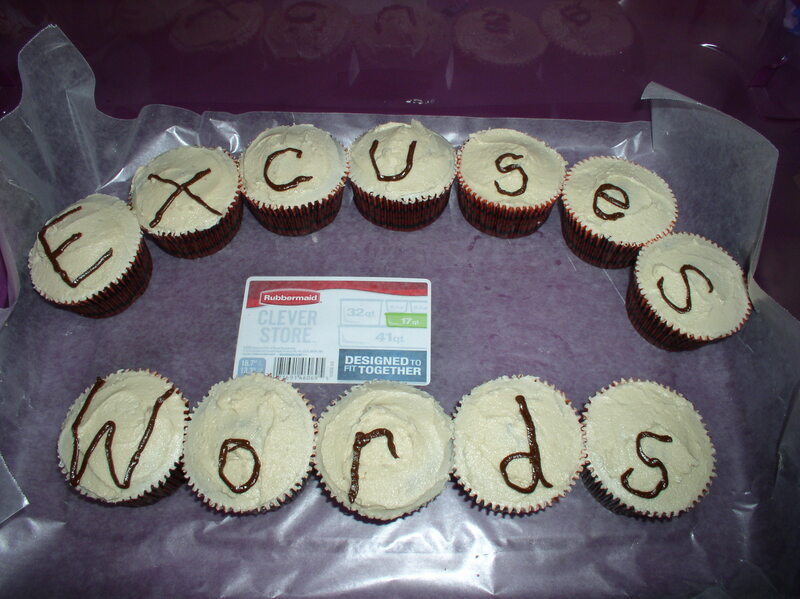 This entry was posted in Uncategorized and tagged NaNoWriMo on November 2, 2013 by releaf1954.